We planned to honeymoon in Argentina for the beef. Sure, my new husband and I wanted to see the brightly painted rows of houses, watch women in red chiffon dresses swirl to the tango, and fake the Euro-transient hosteling lifestyle on our 3-week trip, but we knew why we honestly chose our destination-- promises of cheap and plentiful red meat. Amidst the stress of wedding planning, I had grown weary and anxious about the prospect of international travel, but some quick research about Argentina sparked my interest. I discovered that this South American country consumes more red meat than any other country in the world. I saw pictures of happy brown and white spotted cows lounging on lush, green grass in the shadows of purple mountain ranges. I read about horseback riding ranchers in leather caps and jackets making parilla, fiery grills filled with fresh meat slabs, for their horseback riding families. I was sold. Surely, Argentina could appease even my appetite. Immediately upon our arrival, we found what we were looking for. Our days in Buenos Aires were filled with white table clothes and red wine. Asado de tira, bife de chorizo, lomo-- we ate extravagant portions of Argentine cuts of beef equivalent to porterhouses and double filets; ate like celebrities on a low-carb diet. After two weeks of fancy eats, I began to feel like we were missing something. We tried to fit in with the locals. Afternoons were spent sitting at cafes, my husband ordering Quillmas beer and eating thin crusted pizzas with ham in his broken Spanish while I stuck with wine and plates of cured meats. But what did the Argentine folk eat when they went out for a meaty evening meal? Surely, they didn't indulge in prime cuts of beef daily; there had to be a casual dining option to satiate their carnivorous appetites. So where was this middle ground between the crisp-collared waiters downtown and the flame-spewing trash can grills we saw on the edge of the city? On an exhausting afternoon hike between wine tastings, weighed down by my Malbec-filled backpack, I spotted crowds of lunch-goers pouring out of a small cafe near the touristy Florida street. They were chatting happily and eating thick, steaming sausage sandwiches. Had we found the secret alternative to the empanada? Blood sugar falling from anticipation and hunger, we dropped off our bags at the hostel and stumbled back for dinner. What followed was certainly not the healthiest, most pristine, or even most trustworthy meal of my life, but it was possibly the most satisfying. We were gluttonous. Instead of opting for the safe-looking sandwich, my husband pointed to the "grill for two" option on the menu. A personal-sized grill piled with meats cooked on the cafe's larger parilla was delivered to our small corner table under the glow of a television playing the night's football match. We ordered cheap wine. And we ate. Pork chops and stomachaches. Heartburn and bright-red plump sausages. 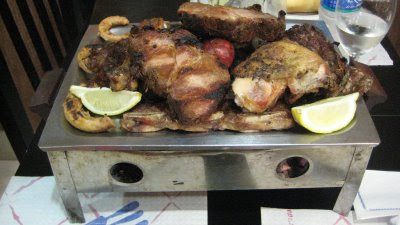 Rich, oily lamb chops and crisp, greasy chicken skin piled over... were those goat intestines? This was a whole new class of meats, like that bag of cheese puffs that you crave after a night of too many cocktails even when the best raw milk brie or ripe, pungent Roquefort is just steps away. This was meat junk food; and entirely worth a night of restless sleep and rumbling bellies. After that meal, we continued on with our fancy eats routine. Cloth napkins and sparkling water, tiny bowls of shiny black olives, double orders of dulce de leche. Though my husband didn't have a leather cap or horseback riding aspirations and my tango was yet to be prolific, our stories of food-filled adventures were our own; our honeymoon of meats was complete. the journey of an aspiring meat artist. more about dad than meat. have your trendy coffee and save a monkey too.